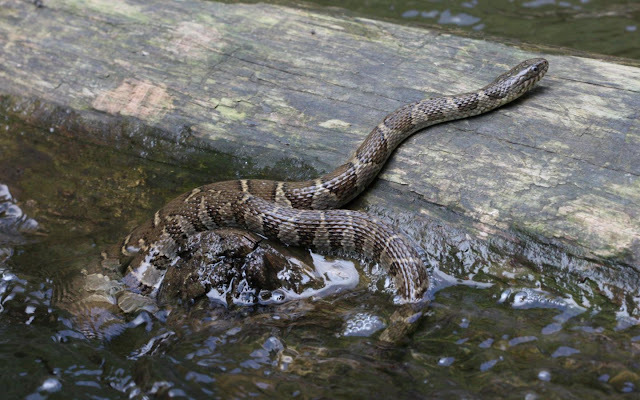 Known for their eagerness to bite when handled (and the anticoagulant properties of their saliva), Northern Water Snakes are a common species throughout much of eastern and central North America (map). These snakes appear to either have evolved color patterns that mimic venomous snakes like the Cottonmouth (Agkistrodon piscivorus), or their coloration is simply a case of convergent evolution. Either way, many people are quick to kill any venomous snakes they encounter and the similarity between Nerodia sp. and some venomous snakes often costs the misidentified water snake it's life. Below are a few photos of Ithaca, NY area Northern Water Snakes from July and August of 2009 (as always, click to enlarge). I was actually out trying to get bit when I took these, as I wanted to informally check out their anticoagulant saliva by comparing bites between these and comparably sized Eastern Garter Snakes (Thamnophis sirtalis sirtalis). The results? Well, I wimped out... all I could get close to were the larger water snakes and I wasn't THAT eager to see how much they could make me bleed. Hopefully I'll have better luck this year - ha! Figure 1: A largish individual getting ready to shed. Note the opaque eyes and overall faded look. Figure 2: An even larger (female?) individual basking on a boulder in the middle of a creek. Figure 3: A smaller (male?) found a few feet from the above female. As someone who has been bit several times by many different species of non-venomous snakes, I can concur that Northern Watersnake bites bleed like crazy despite the bite not being any more serious than similar sized Black Racers or Rat Snakes. The Red-bellied Watersnakes also bleed quite a bit, but not as bad as the Northerns.